When considering what it takes to succeed at work, we often focus on innate strengths: high intelligence, the ability to learn, the ambition to achieve, and the social skills to develop strong relationships. But these characteristics always coexist with weaknesses—aspects of personality that might seem innocuous or even advantageous in some circumstances but that when left unchecked can wreak havoc on careers and organizations. 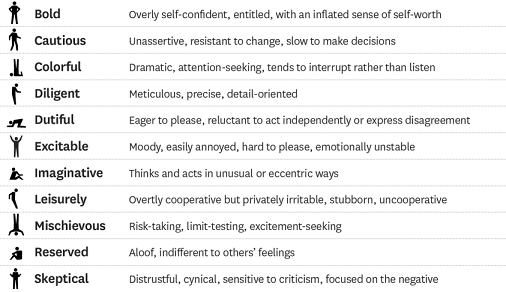 Two decades ago the psychologists Robert and Joyce Hogan created an inventory of these “dark side” traits—11 qualities that when taken to the extreme, can have negative impacts on performance. To learn more, visit https://hbr.org/2017/09/could-your-personality-derail-your-career.